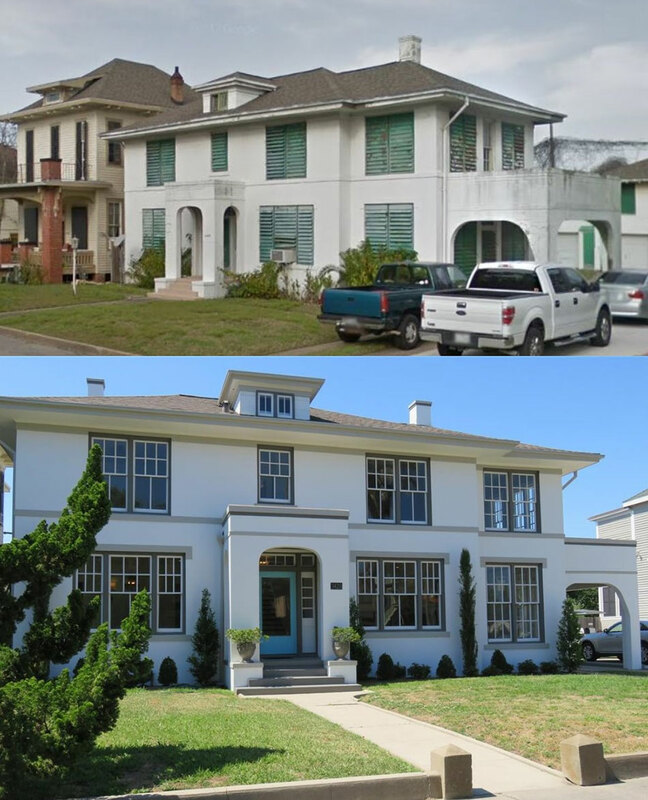 The 2018 Sally B. Wallace Preservation Awards, recognize outstanding projects and craftspeople involving the preservation, restoration, and enhancement of Galveston County’s historic buildings and neighborhoods. 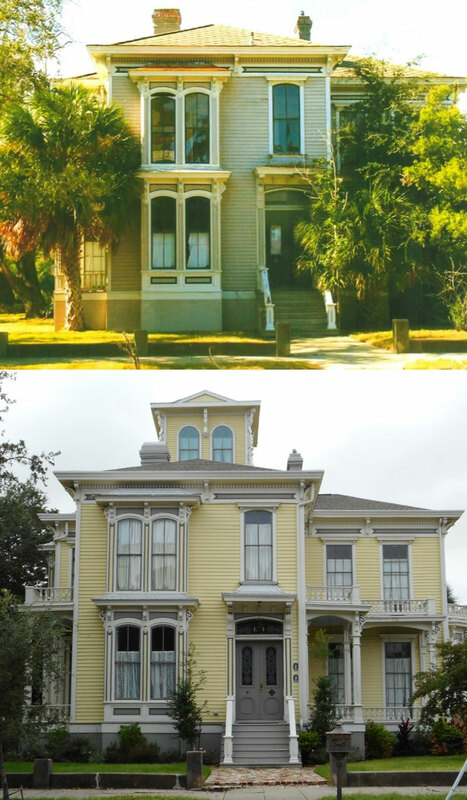 The annual award ceremony is named after the late Sally B. Wallace, one of the driving forces behind Galveston Island’s preservation movement and a pivotal figure in saving the antebellum Ashton Villa from demolition. Trinity Episcopal Church was established in 1841. After the death of the congregation’s first rector, Benjamin Eaton, Nicholas J. Clayton was chosen to design a chapel to honor Eaton’s memory and years of dedicated service. In 2016, after raising funds through private donations and a generous grant from the Moody Foundation, restoration of the historic chapel began, led by the architectural firm of Graham B. Luhn Architects. The scope of work, led by J. W. Kelso Company Inc., included in-kind repairs to the original plaster walls, wainscoting, trim, ceiling medallions, doors and windows with the original paint colors replicated throughout. In the attic, six wood trusses were replicated to match the original design and replaced while termite-damaged trusses were repaired in place. Damage to the second floor, used as a gymnasium for the past 50 years, was also repaired and the stage was rebuilt and strengthened based on the original design. On the exterior of the building, all four masonry walls were washed, repaired and re-pointed. In addition, ADA compliant restrooms and elevator were installed as was new LED lighting to enhance the building’s detail. The newly restored Eaton Memorial Chapel will be used to support the daily activities of both the church and the school and will be made available to the community for private events. Located in the western end of the Strand Mechanic Historic District, the Fadden Building was designed by architect Nicholas Clayton in 1898. Clayton, one the state’s most noted 19th century architects, designed the building for James Fadden’s wholesale wine, liquor and cigar business. In 2014, the property was added to GHF’s Heritage at Risk List after the foundation and footings of the building were damaged during construction of the Island Transit terminal to the building’s west. Turner Construction, the contractor for the terminal, purchased the damaged Fadden building in 2014. Working with engineers Luke Pronker and Norm Hoffman, Turner began a scope of work that included a new steel support frame with new concrete footers inside the existing building; repairs, reinforcement and stabilization of the building’s walls, roof and floor joists; and replacement of wood columns and support wall damaged during a 1979 fire. The interior of the building was remodeled, exposed brick walls were cleaned and re-pointed, and structural enhancements were installed to bring the building up to current code. Completed in 2017, Turner Construction sold the property to Landmark Hospitality Group, who opened their upscale restaurant concept, Hearsay on The Strand, in the building earlier this year. In 1915, Brooklyn native Lester Davidson opened a hotel on the second floor of his new building located on the corner of 20th Street and Mechanic. Featuring Prairie School inspired features, the downstairs bays fronting 20th Street provided retail storefronts that supported the hotel. As years passed, the building fell into disrepair and after Hurricane Ike in 2008, the building was abandoned. The current owner purchased the vacant property in 2014 and worked with architect David Watson on a four year rehabilitation to save the property that was marred by neglect, wood-rot and extensive termite damage. Watson’s plan began with the roof which was rebuilt with new support beams and trusses, replacement of the steel I-beam that supported the upper load bearing masonry walls, replacement of major portions of the second floor framing and removal of the entire first floor concrete slab, which sank 6” after Hurricane Ike. A new concrete slab was poured and the first floor divided into five, single car garages to support reconfiguration of the building as five separate luxury row-houses with second floor levels that contain open kitchens and living areas, master suites and balconies. Throughout the project, the building’s unique, geometric details were maintained. 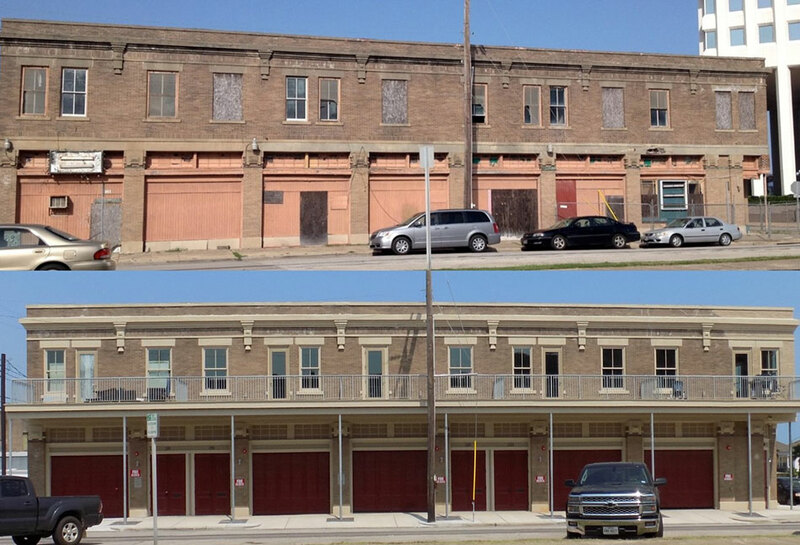 The completed rehabilitation gives the Lester Davidson building new life contributing to the revitalization of historic downtown Galveston. A classic example of Italianate architecture, early Texas land speculator J. Mayrant Smith hired architects Joseph Sherwin and Thomas J. Overmire to design a house in 1874 for his private residence. Smith did not occupy the house for long- by December 1878, the Galveston News reported that he was in the city visiting, noting he had “permanently” retired to his sugar cane plantation “nine miles west of Richmond Texas.” Susan Hartley, widow of early Texas legislator Oliver Cromwell Hartley, became the property’s second owner. The house had been vacant for nearly 20 years when the current owner purchased the property in 2012. A year later, Chuck Morris Coastal Homes began an extensive rehabilitation of the building that included stabilization of the building’s foundation, installation of a new roof and new mechanical systems, restoration of the original hard wood floors and installation of plaster crown molding on the first floor, recreated and replaced using existing pieces to create 4’ molds. With the help of historic photographs, a rooftop belvedere removed in the 1940s was also recreated. Throughout the project, numerous craftsmen and artists were used during the building’s rehabilitation. Completed in early 2018, the Smith Hartley house was highlighted during GHF’s annual Historic Homes Tour this past spring. Edgar and Susan Ritter hired Johnson Brother Contractors to build this two-story Mediterranean style house in 1922. Ritter was president of Galveston’s Model Dairy while Susan served as the dairy’s secretary and treasurer. After her death in 1929, Ritter sold the house to Dr. H. Reid Robinson, who used it as his residence until 1966. The property changed ownership numerous times before it was purchased by the current owner in February 2017. Highlights of the 15 month rehabilitation of the property included removal of exterior ARAMCO blinds to reveal the original six-over-two windows which were hand-scraped and re-glazed; demolition of interior alterations and additions to reveal the original 1922 floorplan; new mechanical systems were installed and the original floors, doors, plaster walls and built in cabinetry were repaired and restored. Downstairs, a custom kitchen was added to the rear of the house and additional foundation and load-bearing supports were added to accommodate a master bathroom suite on the second level. John Fanz Staub designed this elegant house for William Lewis Moody III and wife Mary Guinard Moody. 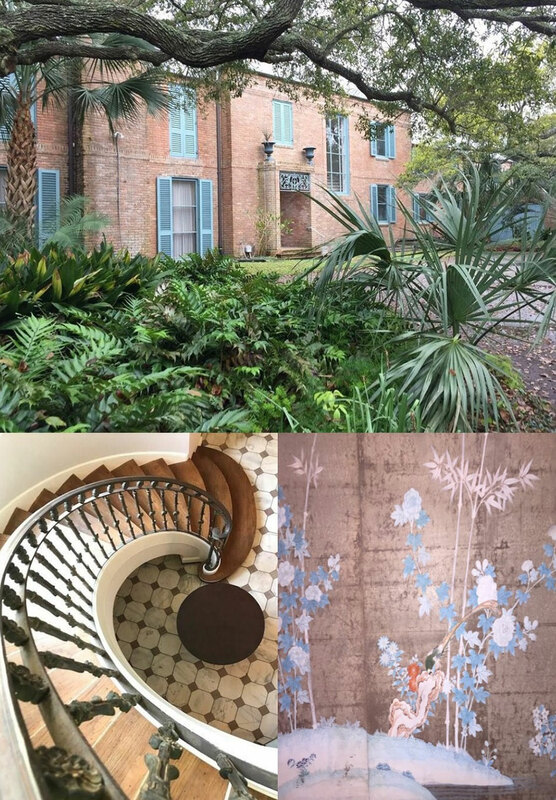 Completed in 1938, the property is one of three projects in Galveston associated with Staub, best known for his traditionally styled houses in Houston that include his best-known work, Bayou Bend. Staub’s concept for the Moody house is classical in design and proportions and similar to his other works often described as country houses. Wrought iron decorations around the main entry and grand staircase reminiscent of French Creole architecture add to the charm of the house and provide visual contrast. The current owners purchased the property in 2014 and immediately embarked on an extensive and thorough rehabilitation of the property with particular care to maintain the original features of the house that include a marble floor salvaged from the 1891 post office building, Chinese wallpaper, and a monumental spiral staircase. In recognition of their efforts as well as the building’s historic and cultural significance, the City of Galveston designated the William L. Moody III House a local landmark in 2017. 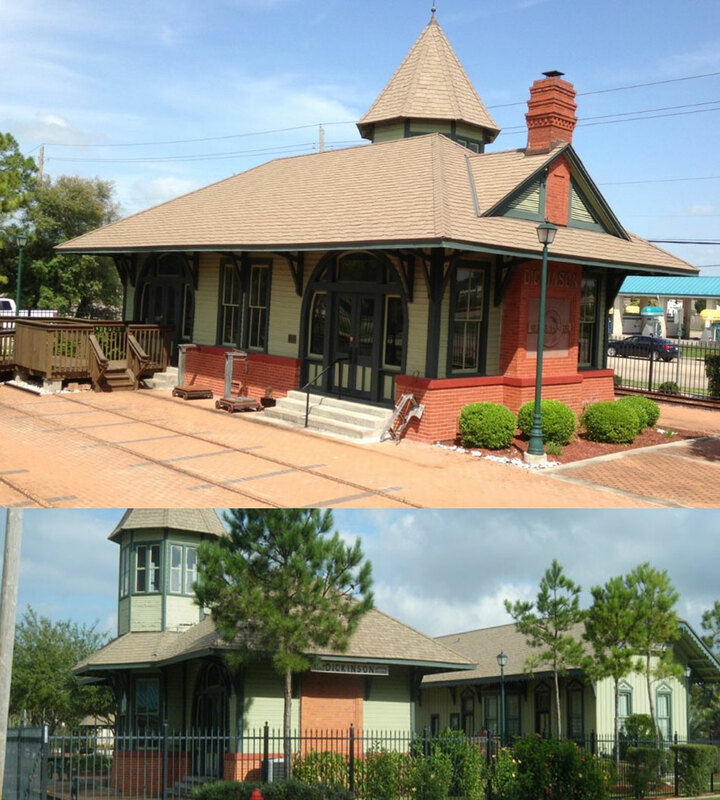 After the original Dickinson Railroad Depot was destroyed by fire in 1900, a new depot was designed and built in 1902 by prominent Galveston architect, George B. Stowe. Located on Highway 3 along the Galveston, Houston and Henderson (GH&H) railroad line, Stowe’s design called for a brick fireplace, double half -moon doors, a bay window overlooking the track and an elaborate cupola. Having served its purpose and no longer needed, the GH&H Railroad Company donated the building to the Weed ‘N Wish Garden Club in 1966. By March 1967, garden club members had raised the needed funds to move the depot to the current location, 218 FM 517 West, where it was restored and maintained it as a community center. Ownership of the depot passed to the City of Dickinson in 1977 who formed the Dickinson Historical Society (DHS) in 2000 to help raise funds to restore and maintain the historic building. Since 2001, management and stewardship of the Dickinson railroad depot has been the responsibility of the historical society. Their most recent challenge came after Hurricane Harvey damaged the depot’s floors and museum exhibits. DHS worked tirelessly with the City of Dickinson and FEMA to determine the best way to address the damages while respectfully campaigning against the city’s recommendation to replace the original flooring. Using funds received through grants provided by Harvey Arts Recovery Fund and Humanities Texas, DHS hired Galveston floor expert Bill Hynek to repair the original wood floors and help alleviate future moisture problems. Because of Dickinson Historical Society’s dedication and commitment to proper stewardship, plans are underway for new ways to display the community’s rich history and George Stowe’s remarkable depot for the benefit and education of all Galveston County residents and visitors. Many older residents of the community of Dickinson are able to recall stories of how their relatives would visit the Dickinson Seed Store on Goar Street to purchase seeds for planting vegetable and flower gardens. The circa 1929 building was erected by Italian immigrant Joseph Giacchino next door to his residence where he operated the seed store until his death in 1962. After Giacchino’s death, his daughter, Caroline Mallory, maintained the small business until it was permanently closed in 1997. 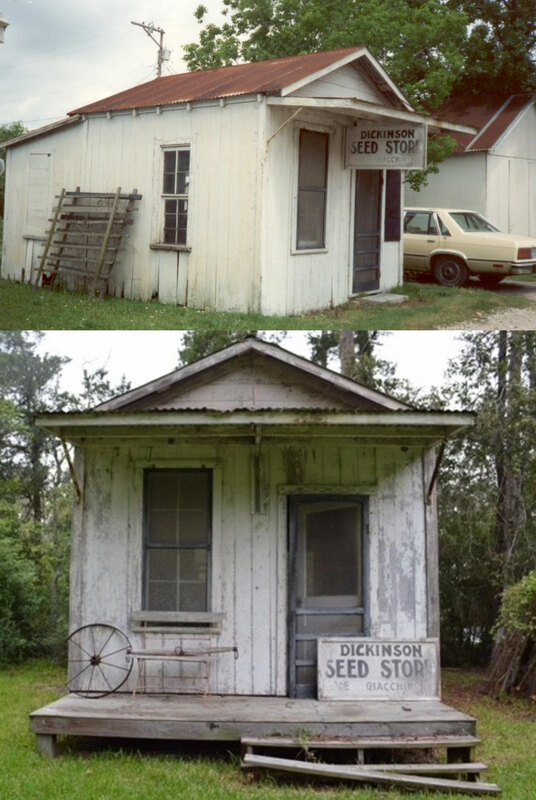 Abandoned and threatened with demolition, Jim and Carol Yates seized the opportunity to save the historic Dickinson Seed Store from destruction in 1998. After they purchased the one room storefront they moved it to their personal property where they have maintained the building for the past two decades at their own expense. When they recently decided to move to Fredericksburg, Jim and Carol donated the historic seed store to the Dickinson Historical Society. In the near future, the building will be moved to the Historic Railroad Center complex at 218 FM 517 West. Once relocated the historic seed store will be used as an educational and mini museum utilized for special events and guided tours. Future plans also include specialty seed packets and other items for resale to the public. Because of Jim and Carol’s efforts and their dedication to both the community of Dickinson and the Dickinson Historical Society, the Dickinson Seed Store will be preserved for the benefit of future generations. The annual award ceremony is named after the late Sally B. Wallace, one of the driving forces behind Galveston Island’s preservation movement. In 1969, Wallace was elected President of GHF and was instrumental in the Foundation’s restoration of Ashton Villa. Among many other achievements, Wallace worked to establish the East End Historic District and was among the early advocates of bringing the ELISSA, now the official “Tall Ship of Texas,” to the city’s waterfront. Wallace also was the founder of Hendley Market, one of the first major businesses opened on the city’s historic Strand as the downtown restoration movement began. “This historic preservation work is inspiriting to us individually and as communities. It continues our connection to the past and makes us retain irreplaceable historic buildings for the future. We look forward to awarding some of the best projects in our county submitted for these awards,” states Dwayne Jones, Executive Director of Galveston Historical Foundation.